Today there are many ways for readers to enjoy books. Audiobooks and Playaways, for those who prefer listening to books, are available to borrow from HPL as well. Despite these options, I still prefer reading, and holding in my hands, an actual book. Hey, books are one reason I decided to become a librarian! A few months ago I drove to Washington, DC, to visit one of my best friends. I decided to borrow an audiobook for entertainment on the four hour drive–and to avoid the inevitable loss of familiar radio stations during the trip. Tina was good company. It was almost as if she was in the car with me. She talked about her childhood and her awkward teenage years, which was way more entertaining than recounting my own childhood and awkward teenage years. I liked Tina’s behind-the-scenes stories about her time on Saturday Night Live, as I am a longtime fan of the show. She recalled giving notes to Sylvester Stallone on a sketch she wrote, and felt intimidated as she was relatively new to SNL and he was a huge celebrity. Tina said Sly was totally cool about the feedback, though. My favorite part of the audiobook was the origin story of Tina’s brilliant, award-winning portrayal of Governor Sarah Palin on SNL during the 2008 presidential election. After Palin was announced as Senator John McCain’s running mate in August 2008, many people noticed a resemblance between her and Tina. Tina believed people made that connection because she and Palin wore similar eyeglasses. Lorne Michaels, SNL’s creator, asked Tina to return to the show to play Palin in a sketch. Tina said that was a particularly busy week–she was planning her daughter’s Tinkerbell-less, Peter Pan-themed birthday party and filming an episode of 30 Rock on which Oprah was a guest star. Tina agreed to do the sketch if it included Amy Poehler*, her co-anchor on SNL’s Weekend Update segment in the early 2000s, and with whom she performed improv with The Second City in Chicago earlier in their careers. Lorne agreed, and SNL head writer Seth Meyers wrote a sketch where Tina played Palin and Amy, who was then very pregnant, portrayed Hillary Clinton. The sketch was a huge hit. Tina nailed Palin’s accent and mannerisms. She even returned to SNL to reprise the role several times. The audio of this sketch is included in the audiobook, and it is still as funny now as it was in 2008. Did you catch the joke about Sarah Palin’s “Tina Fey glasses” at the four minute mark in the video? 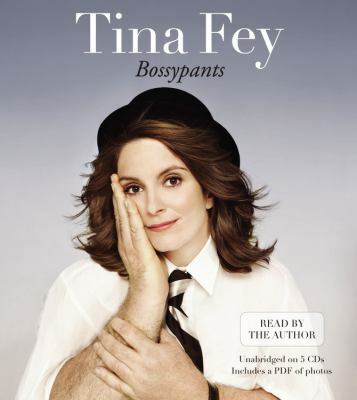 Although I listened to the audiobook, I still want to borrow and read the actual Bossypants text. Tina made many references to 30 Rock that I couldn’t follow as I wasn’t caught up on the show until now. If you’re planning a road trip and want some light entertainment for the drive, definitely consider Bossypants. This audiobook made driving on I-95 much less boring. Don’t forget, there are plenty more audiobooks available at HPL, and from other libraries in the consortium. I definitely plan to borrow another audiobook for my next (currently unplanned) road trip. *Apropos of nothing: Amy Poehler was on the Upright Citizens Brigade in the late 1990s before she joined SNL, and an episode of that show was filmed in my high school’s cafeteria when I was a student. I did not meet Amy, but saw her film some scenes. If only I could have met her then, before she became famous!